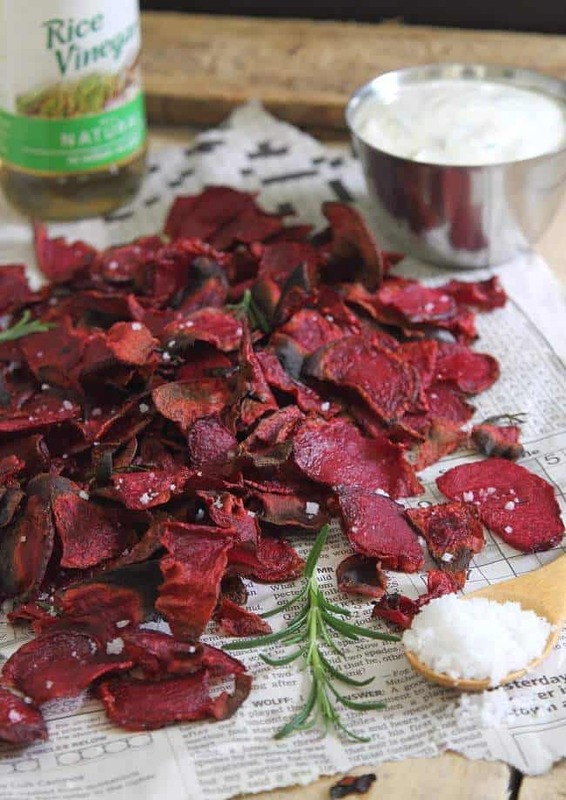 These rosemary sea salt and vinegar beet chips are a fun, crispy and healthier snack served with roasted garlic yogurt dip. For years I’ve said I’m not a chip person. And for the most part, that’s true. Salty food cravings are very few and far between for me. Chocolate cravings, however, that’s another story. A day can’t go by without some sort of chocolate consumption happening. But then I found myself with 3 of the largest beets known to man (seriously, one was the size of a baby’s head) and decided to make chips. And…now I might be one of those salty people. When I do decide to eat chips, I’m not wasting the event on any old chip. No, no. When that whole “salt & vinegar” chip thing became, well, a thing back in the 90s, I was in heaven. I LOVE vinegar anything. I’ve told you many times on here how I will drink vinegar out of salad bowls and happily splash balsamic on my fries so chips without vinegar are just not worth eating in my book. 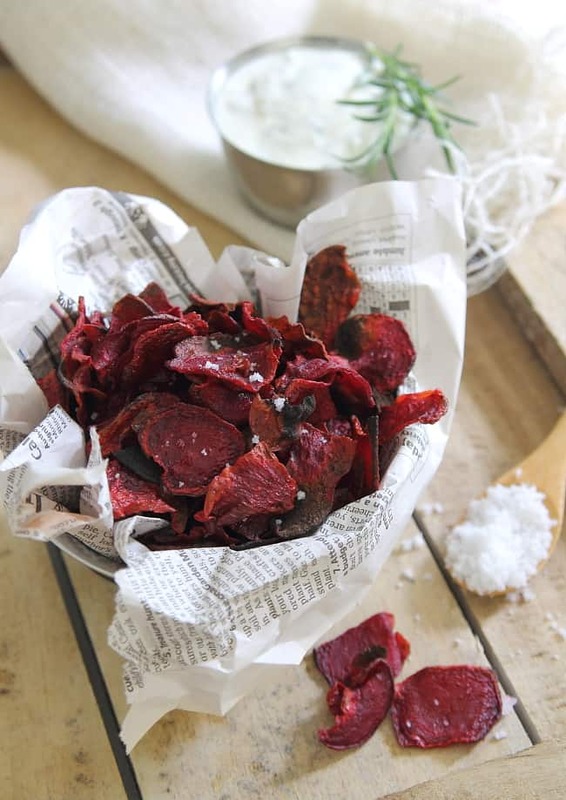 These beet chips live up to all expectations, vinegar flavor included. They’re soaked in Nakano natural rice vinegar for 15 minutes before getting pan-fried with rosemary to crispy perfection and they’re bursting with that tangy vinegar deliciousness because of it. Sprinkled with some coarse sea salt and they are a serious game changer in the salty vs. sweet decision. Place sliced beets in a large pot. Add rice vinegar until just covering the beets. Bring to a boil, turn off heat and let sit for 15 minutes then drain. Once oil is hot, add the beets in a single layer. Pan-fry the beets for about 1-2 minutes on each side until they start to crisp up. Transfer to a paper towel lined plate to drain and repeat with remaining beets, adding oil as necessary to the pot/skillet. Sprinkle with sea salt and the remaining rosemary sprig and serve warm. Combine all ingredients in a small bowl and stir together. Not up for frying? You can easily bake these as well. Lay beets on a parchment lined baking sheet and bake at 375 degrees for about 20 minutes, flipping half way through. Remove beets as they crisp up and brown, some will be done before others so watch carefully towards the end. Conversely, you can also deep fry these for a more indulgent treat. I wouldn't recommend using olive oil for that, canola or vegetable oil would be best. Headed on a road trip vacation this summer? Whip up a batch for easy snacking on the go for a healthier alternative to convenience store snacks. This post is sponsored by Nakano as part of my ongoing brand ambassadorship with them. All opinions, content and photography are my own. I have never been much of a chip person either. But, the only kind I ever grew up eating was salt and vinegar! I have seriously only ever made beets once. Judge me. Clearly, these are going to change that. Pinned! 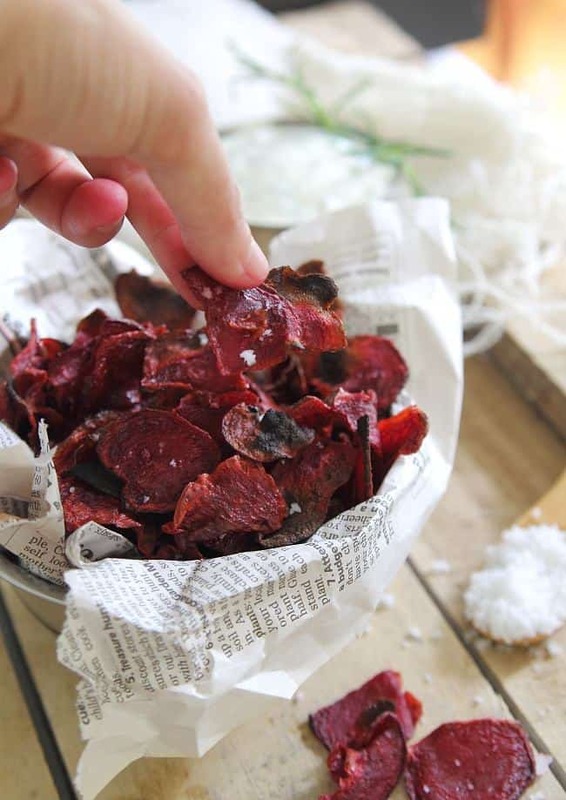 I LOVE beet chips and these look phenomenal! Although I’m not a vinegar person when it comes to chips. I feel like I’m definitely in the minority on that one. I’m sure these would be amazing without vinegar too. I am in LOVE with this recipe, totally making these for a poolside treat this weekend. These look great. I am about to start getting beets in my CSA, and I feel like last year I wasn’t quite sure how to deal with the bounty. This year, I have this lovely plan! I adore this idea Gina. They look gorgeous and the flavors are perfect. Can’t wait to try these. I am definitely a savory person, I’ll literally eat anything with salt on it! 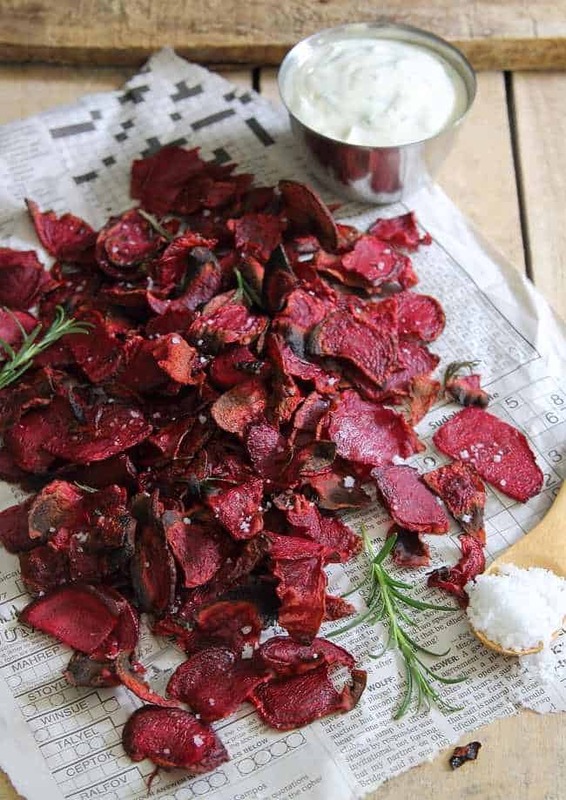 These beet chips are just absolutely stunning! Thank god I know I’m not the only one who could usually care less about chips but requires chocolate on a daily basis. These, though, look and sound totally crispy, flavorful, and amazing, and I love the photos. Pinning for sure! Yup! Completely obsessed with salt & vinegar chips.. in fact just had some today for lunch! Love beets too so basically this is the ultimate combo that needs to happen asap! The color is awesome! PS. a beet the size of a babies head.. holy smokes! This sounds like my own personal heaven. Gotta make ’em! We’ve got so many beets in the garden! Soaking the chips in rice vinegar? Genius! Beets are a favorite. Can’t wait to make these. Am pinning this recipe now. Thanks for sharing. Oh, Lord. These are beautiful. I really have to try ’em. I tried to make these tonight & baked them. I think I cut them too thick b/c they weren’t chip like. They were soft with chip-like edges. I would try again with doing them your original way though. Yeah, it’s really hard to get them thin enough for chips by hand cutting. A mandolin or the slicer attachment on a food processor is kind of necessary. I’ve tried by hand and without serious precision (and who the heck has time for that?!) they come out too thick. Hope they were tasty at least! Wow, beet chips. These sound awesome. Love that they can be baked. Dumb question…do you need to peel the beets first? We’ve got a bunch in the garden and usually the very outer part is woody. I just scrubbed them real well but if yours are woody, I’d probably peel them first. I’ve made these but I don’t fry them. I put oil on baking tray add sliced beets n seasonings . Make sure a little oil is on each one and bake at 200 until crisp. I make kale chips this way too! The newsletter goes out to 215 people, so I hope you received some traffic from it! I have beets in my fridge and I’ve been looking at something to do with them! Thanks so much! I’m part of a CSA so I get TONS of beets. This recipe lloks amazing! I can’t have potatoes so that would satisfy my craving for chips! Made these. I found it difficult to get the middle of the “chip” crispy without overcooking. Any tips? Also, should the sea salt and rosemary be put on before or after the chips have cooled? you should season them when they’re fresh and hot, the seasoning adheres better that way. Getting the middle of the chip crispy is probably more about how they’re sliced. A mandolin, if you have one, is your best bet for uniform texture otherwise you just need to be consistent in your slicing with a very sharp knife! Have you tried frying them in a fryer versus the pan frying? Seems less time-consuming but don’t want to sacrifice texture! I haven’t as I don’t have a fryer but I’m sure it would work fine and definitely save you some time!